Design Thinking continues to be a hot topic (this article is one of many talking about it). Design Thinking has been hyped and even fetishized but there are also voices questioning its value, impact, and relevance. Design Thinking faces criticism for its lacking integration with business and compatibility with market reality. There are organizations that see Design Thinking as unnecessary rather than essential to driving organizational change and innovation. Does Design Thinking have to be reinvented or even replaced? Design Thinking is being widely misunderstood. It is often associated exclusively with the design discipline or seen as a creativity tool that involves an enormous amount of post-its. Many mistake Design Thinking for design methodologies or the design process itself. Design methodologies are undoubtably part of Design Thinking, but they are not one and the same thing. Design Thinking is broader and more holistic and is not limited to live within the design discipline alone. 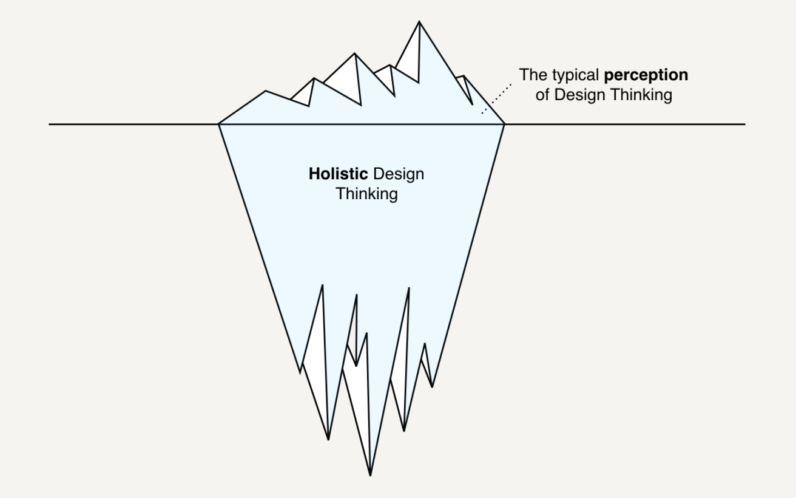 While the design discipline is a main driver for Design Thinking, it does not own it. Design Thinking stretches across disciplines. The true potential of Design Thinking is its collaborative force of bringing the disciplines together to create a holistic product vision. The Design Thinker makes empathy for business needs part of a broader context together with human needs and desires. Design Thinking became first relevant in a time when designing products was predominantly driven by business and tech rationales. The human was seen as consumer or user (don’t be fooled — there is a predominant technocratic notion to the term “user”). The design discipline and its focus on the human was still nascent and in permanent need of fighting for consideration in terms of its relevance, its inclusion in processes, and (above all) resources. Design Thinking doesn’t try to replace business or tech rationale. Design Thinking shifts the focus from a pure technical solution to a human solution. It puts understanding context and continuous engagement with humans at the heart of the practice — for determining what problem to solve, what metrics drive success, and what business will emerge from solving the human problem. Putting the human in the center of the product rationale is essential unless you are creating products for robots or rabbits. Great products solve human problems. Humans need to find a product delightful in order to develop a desire to purchase and to own it (either temporarily or permanently). Products that don’t generate value for humans will not generate revenue for the business.And yes, products need to function too, even more so in an expanding on-demand economy that requires products to perform perfectly to be successful. The business, tech, and design disciplines naturally have distinct perspectives on the human and approaches to problem solving. Business would like to see a product generate crazy amounts of money, tech wants it to function flawlessly, while the design discipline wants to create a product that is so desirable that people lose their minds over it. Design Thinking is about human problem solving including the business or technical problem. They all need to be viewed together, iterated together, resolved together. At its core, Design Thinking is a formalized practice solving human needs as holistically as possible, with the full spectrum of success criteria in mind. Design Thinking is a deeply collaborative approach. The challenge Design Thinking faces in practice is that it is perceived as too disconnected from business because of its general misperception and its uncredited impact. But Design Thinking does not lack a business component. The problem is how Design Thinking is applied and that its impact on business outcome is not being effectively measured. The disciplines have different perspectives on the product and will not be naturally empathetic to the other disciplines’ points-of-views. This behavior is naturally driven by limited resources, a historically first business, then technology-driven approach to product and service development, and the continuing misunderstanding of the focus of design. It is crucial to have a highly interdisciplinary “Product Discipline” in the center of the product team that builds shared vision and develops cross-discipline empathy. The Product Discipline is formed by leads from each discipline and the Product Manager. The Product Manager can belong to any of the disciplines but above all must be a strong cross-discipline thought leader and needs to act like a product owner. Product Managers need to inherit a strong and holistic vision of the product and evangelize it across the entire product team and the organization. Core competencies of Product Managers are to facilitate collaboration and dialog between disciplines, understanding and valuing each discipline’s priorities and contributions. Discipline-hybrids are design engineers, creative technologists, business designers, design strategists, and technical product managers and are a key component in applying Design Thinking across disciplines and avoiding their siloing. Discipline-hybrids typically have their background in one of the disciplines and have gained extensive expertise in another discipline. Discipline-hybrids build bridges across discipline intersections which is crucial for putting a truly collaborative process in place. The peripheral areas of each discipline can be more homogeneous and have a more predominant focus on their core competencies (accounting, design production, development, etc.). Design is a natural ally for Product Management as it brings critical skills such as storytelling, conceptual abstraction, and an ability to make things tangible to the table. This is critical for articulating a product and its distinguishing magic. Design and Product Management can form a powerful and convincing symbiosis with business and technology providing essential ingredients and problem solution parameters. The organizational philosophy of Design Thinking results in interdisciplinary teams forming a broader frame for product teams. They create the environment needed for out-of-the-box thinking and focus on quality at all levels. Interdisciplinarity at the core of product teams means for design teams to work within product verticals. Design teams that become too isolated, can face the danger of “dissolving” inside the product vertical. The continuous exposure to business and tech rationales can cause design teams to soften their focus on the human as their core competency. A strong and transversal design discipline strengthens design competence across product verticals. A transversal design discipline typically has a matrix structure. Horizontals represent the different design sub-disciplines and are led by Design Discipline Leads that act as design consultants across the different product verticals. Design Discipline Leads are responsible for growing design competencies across the entire design discipline. The design teams within product verticals are led by Service Design Leads Leads (SDL). The SDL’s focus is primarily on the product. SDLs work hand-in-hand with Product Managers. A transversal design discipline is essential in developing a coherent design language across the organization and brands and allows the design discipline to act strategical and above all to drive Design Thinking. Organizations without an internal design discipline will work with external design consultancies that essentially act as design discipline. It is crucial for the consultancy to build bridges into and across the organization’s disciplines. In order to do so, the design consultancy needs to “replicate” the business and tech discipline within itself. Once more the discipline-hybrids play a crucial role here. Discipline-hybrids are part of the consultancy team and reach out to discipline leads inside the organization and other peers to build strong relationships. Building trust is indispensable when evangelizing Design Thinking inside the client organization especially as it requires a cultural shift that is hard to make in companies whose culture is usually tied to technical roots. Trust usually needs success stories to be built and cultivated. Design consultancies need to be facilitator to keep the dynamics of interdisciplinary teams looking beyond their immediate parameters, goals, and deliverables. Interdisciplinary teams need to create symbiosis rather than challenge each other collaboratively. Business plans are great but are by nature based on assumptions about a market and the behavior of the humans inside it. It’s impossible to fully predict how a product will behave once launched. Just as prototypes are used to find evidence for the desirability of an idea or concept, the early launch of a minimum viable product (MVP) can help validating a business hypothesis. Lean Startup Methodologies embraced MVP strategies and in essence are a way in which Design Thinking is applied to business practices. The challenge is that MVP is often interpreted as figuring out what the minimum set of features is that can be implemented in a specific time period, without establishing other key criteria that define what is truly minimum and what can be validated through it. The MVP cannot be seen as a reduced set of features. The term “viable” implies an business-exclusive perspective. Defining a MVP needs to be an interdisciplinary and collaborative effort. Besides aiming for the minimum viable product, the minimum desirable product (or “Minimum Viable Experience” per Pamela Mead) and the minimum feasible product need to be part of the equation. Experience metrics are an essential component of product KPIs together with business and technical metrics. The design discipline needs to have a strong mandate to establish experience metrics to be able to assess the quality of the product experience for humans. While business metrics address mainly commercial goals and technical metrics concern the quality of implementation, experience metrics set scope for the desired human behavior and interaction with a product. The resulting quantitative data is crucial to understanding Design Thinking’s impact on business outcome. By making Design Thinking quantifiable, resources allocated to the design discipline will become justifiable, in particular for the design discipline’s role as driver for Design Thinking. As expectation for design is (partially) set by business goals, these goals will be indirectly reflected in experience metrics. Business, technical, and experience metrics cannot be seen separate from each other but should articulate scope for a holistic product vision and its parameters in a highly interconnected way. Design has evolved from a domain of communication with a predominant aesthetic focus to a human advocacy with focus on relevance and ability. Design still “suffers” from previous attributions and continues being seen by some organizations as a disposable surface domain. The core of design’s mission is to seamlessly translate technology into human value. There is a continuous and ongoing trend of technology (and the notion of “digital”) moving into a sub-perceptive layer with the value of a product surfacing exclusively. Design is the main driver behind this trend and will be even more so in the future. Design is equally relevant for deeply technical discussions around platforms and APIs. The potential of these fundamentally opens or closes possibilities for service development and design helps to identify these. Design advocates the human by understanding human needs and articulates the relationship of humans with products. Products are tools and services that are part of a human ecosystem of tasks and much deeper — almost spiritual — human drivers. Products empower humans and enhance human abilities. In that sense, products are extensions of the human. Design is the discipline responsible for exploring human challenges and developing solutions that — in a broader view — help expand humanity itself. Design Thinking brings these design competencies to the business. Design Thinking has to be understood correctly, applied accordingly, and measured effectively in order for organizations to understand it as essential to thriving organizational change and vision dynamics. Design needs to be viewed as a strategic discipline driving Design Thinking and not as a cost center. Design Thinking means to truly and consequently move away from a narrow technical and business only perspective to a truly interdisciplinary and collaborative culture of thinking and making. Design Thinking brings disciplines together to collaboratively find solutions within a highly complex and multilayered system of business, technical, and human context to ultimately result in products that humans need and desire and are happy to make part of their lives. Special thank you to Pamela Mead for the extensive contributions.